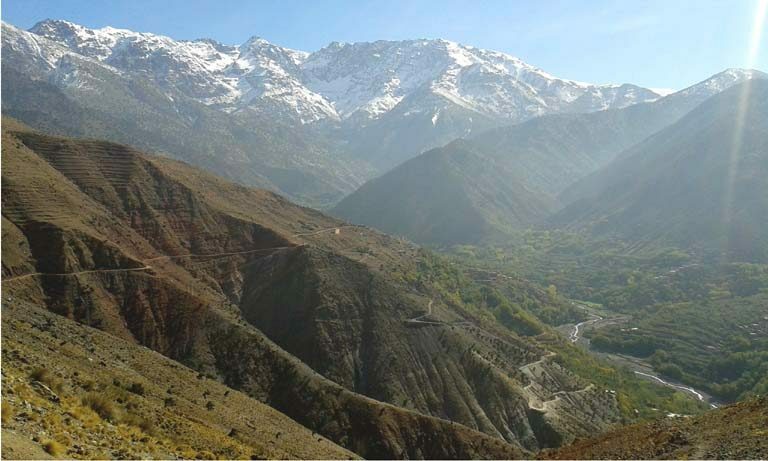 Trek Atlas will allow you to explore beautiful valleys, Berber villages and reach the summit of Mount Toubkal. You will enjoy the uniqueness of Berber culture, gorgeous views of the mountains with the colorful scene of the rhododendron forests. 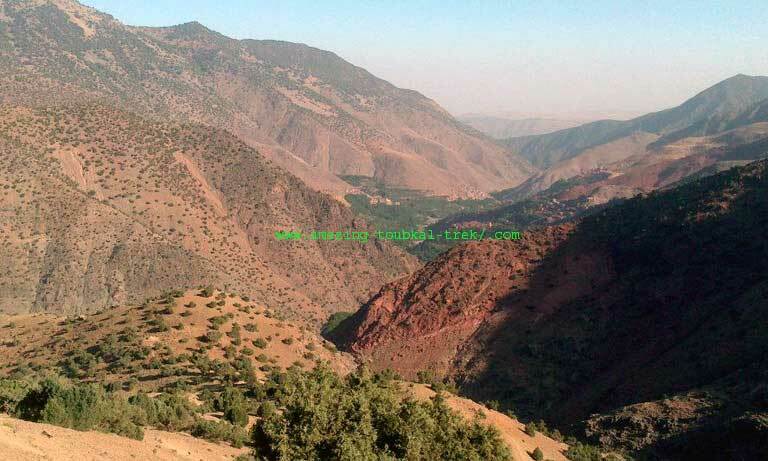 The Atlas mountain is known for its rich and varied Berber culture and its trekking trails. Accommodation: Guesthouse and Neltner hut or camping. – Hike through the traditional villages while enjoying the beautiful scenery. – Climb the highest mountain in North Africa. Early morning, we have a detailed briefing of trek Atlas and then leave for the one-hour drive to the starting point of the Atlas trek. We meet our muleteer team and loading mules with all the equipment we need. We start by walking uphill, and the first day is usually a more leisurely acclimatization trek in the Ouirgane National Park. Overnight in a Gite at Tinzert – a small Berber Village. Approx. 5 hours trek. After morning meal, we head up and outside of the valley and traverse over the fascinating valley of Azzaden. The scenic views open up with a rushing mountain stream that’s surrounded by beautiful walnut groves. Overnight in Gite at Ait Aissa. 5-6 hours trek. Today’s trip involves a fantastic climb outside the Azzaden Valley. You’ll head up the valley towards Tizi Oussem from where you’ll move towards Mzik pass, just before descending into Imlil. Overnight in Guesthouse. 6 hours trekking. After morning meal, we’ll begin our trek Atlas, moving along the Mizane Valley, initially towards the village of Aremd and then onto the shrine at Sidi Chamarouch. We’ll continue in the east direction and cross the floodplains; our route would take us along the mule tracks and up into the high rocky cliffs above the valley. From here, our trail continues to climb steadily, zigzagging and snaking its way up to the snowline and the Toubkal Refuge (3,206m), our stop for the night .5hrs trek. In the morning, we’ll attempt the summit of Jebel Toubkal, the tallest peak in Northern Africa. The walking is straightforward, but the altitude and the screen could make the going difficult a bit. However, the views along the way would make the journey a remarkable one. Upon cresting the ridgeline, we’ll arrive at the plateau, from where it’s a short walking distance to the summit. From the peak, there are views in all directions, from the Marrakesh Plain to the High Atlas in the north as well as the Sahara and Anti-Atlas in the far south. We then return down to the refuge and head back towards Armed. We spend the night in a local guesthouse. 8 hours walk. After breakfast, we take a hiking tour via villages of Imlil valley. In the afternoon drive back to Marrakech. 4 hours of walk. End of trek Atlas. – Trek Atlas is available and can be arranged for groups of all sizes. 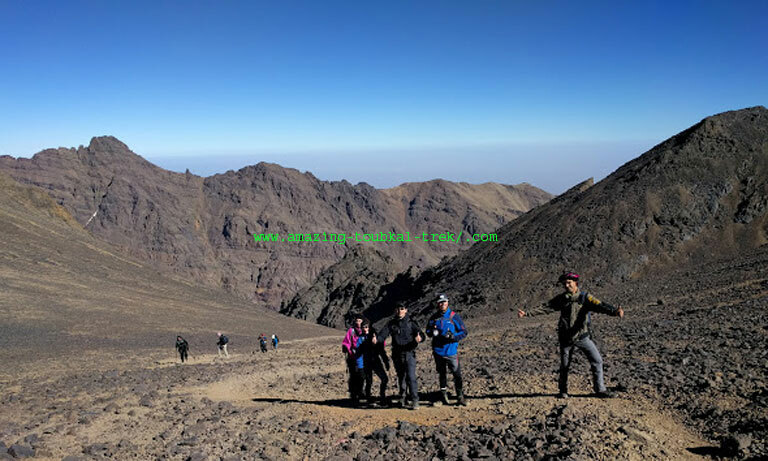 We arrange trek Atlas to explore the valleys of the Atlas Mountains, and ascent Mount Toubkal. 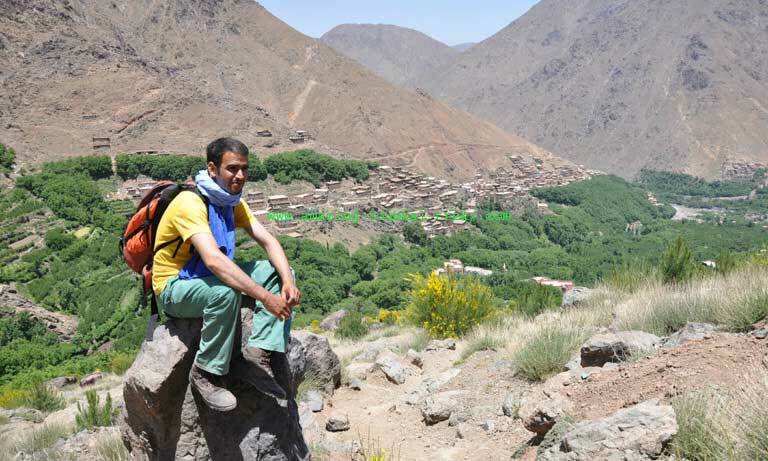 Guided trekking in the Atlas Mountains, Trek Atlas Morocco.